Featured in Michael Fremer's Heavy Rotation in the March 2011 & September 2010 Issue of Stereophile! 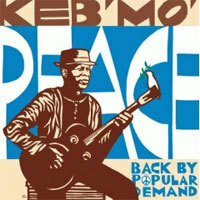 Keb' Mo's mellow protest album recycles classics from the '60s and '70s, recasting them for the 2004 mindset witnessing the greatest strategic foreign policy mistake in American history. Even the opener, Stephen Stills' '60s paranoia-soaked "For What It's Worth" opens the set with a slinky, laid back groove. Harold Melvin and The Blue Notes' "Wake Up Everybody" gets reverential treatment, with Reggie McBride's strong bass line dominating along with Paulinho da Costa's percussion. A string section fills in the open spots. The Rascals' (Brigati-Cavaliere) firey, up-tempo "People Got the Be Free" gets a mellower, more resigned reading, with less emphasis on the horns. In fact Keb' Mo' (Kevin Moore) applies the same easy going tactic to everything here. Keeping the stridency levels low and the groove levels high works really well because Keb' Mo' avoids competing with the originals while making "protest" songs palatable for all. "Talk," an imaginary conversion with the president is the sole original. The message is "Why don't we talk to each other." Other covers include Marvin Gaye's "What's Happening Brother," Chet Powers' "Get Together" immortalized by The Youngbloods, Dylan's "The Times They Are A-Changin'" Nick Lowe's essential "(What's So Funny 'bout) Peace, Love and Understanding" and of course John Lennon's "Imagine,"
the tone-setter for everything here. The recording is superb L.A. studio circa the era in which it was recorded and it was mostly recorded at L.A.'s best: The Village Recorders and Conway. Could this minor project have been recored analog? I just can't imagine that but it sure sounds great, however it was recorded and whatever source was used. Deep tight bass and cracking percussion. How can you go wrong? Its tangible, you can feel it, see it, study it, muse/dream over it, it’s real, someone has spent hours and hours over its construction and presentation. Pure Pleasure Records is just that, Pure Pleasure and that is what it has set out to be. The music and the physical record. Something to keep, treasure, admire and above all enjoy.Of course with vinyl it’s not just a record, it’s the cover, the sleeve notes, you are holding a unique package, produced by craftsmen.